After long months of inactivity, anglers anxious to fly fish open waters would be well served to make a pilgrimage to Grand Lake Stream (Delorme’s The Maine Atlas and Gazetteer (MAG), Map 35, B-4). Open April 1st to fly fishing only, hoards of anglers descend upon the stream, drunk on the prospects of pulling fat silversides from the stream’s turbulent, ice cold waters. Fishing is often fast and furious during the first three weeks of April, with hungry salmon eager to bite hard on any imitation smelt patterns. Widely considered one of the top landlocked salmon rivers in the state, Grand Lake Stream regularly produces salmon of between 16 and 20 inches in length, with larger fish always an exciting possibility. Regulations set a length minimum for salmon at 14 inches and a one fish bag limit on salmon. The dam pool is by far the most popular (and also most crowded location) so those wishing for a quieter and more pristine experience, it is good to explore other areas of the stream. Those new to the “stream” will be well served to hire a Maine guide to help them identify the best fishing spots and pick a winning combination of line, flies and gear to ensure a successful and rewarding fishing trip. 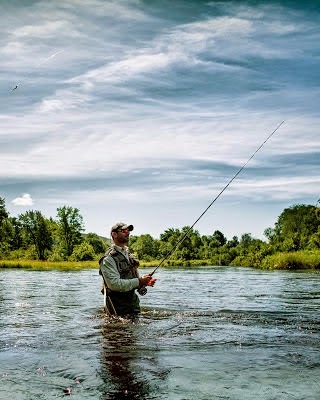 No matter what your skill level, the local Professional Maine Guides, having worked these waters their entire life, will depart upon you some new understanding that will make you a better fly fisherman. The Grand Lake Stream Guides Association (www.grandlakestreamguides.com) is an organization composed of local Registered Maine Guides striving to continue the traditional standards of the guiding in the Grand Lake Stream area. This devoted group of professional guides is dedicated to promoting a quality, ethical and legal outdoor experience for all. Guides can be procured through the local fishing lodges or contacted directly through the “members list” on the guide’s association website. My Uncle Charles "Kim" Vose and Cousin Brett Vose (207-796-5403) are both long time Grand Lake Stream residents, guide association members and in my slightly biased opinion, two of the best guides in Washington County. If looking for a fishing guide in Grand Lake Stream make sure to give them a call! Anglers arriving later in the month would be well served to explore additional fly fishing areas in and around Grand Lake Stream. Another destination, a short drive from Grand Lake Stream, is the impressive St. Croix River, open to fly fishing beginning April 15th. Two spectacular options exist on the river, both offering pools and riffles prime for fishing salmon and trout. The first location exists in the small town of Vanceboro (Map 46, C-3), approximately a quarter mile down river from the Vanceboro dam; anglers will find ample 16-18 inch salmon and 13-15 inch native brook trout, ravenous from their long winter spent under the frozen surface of Spednic Lake. The second fishing location exists in Princeton (Map 36, B-2), about a half mile down river from the Grand Falls Dam. Here in this pool, landlocked salmon congregate, having dropped down from Big and West Grand Lake in search of forage. Fly fishing this time of year can be a struggle, as the combination of cold and wet takes it toll on those unprepared to meet the challenge. Cold water zaps heat from the body 25 times faster than air so it is critical that when fishing, care is taken to stay warm and dry. Maine’s spring is notoriously fickle and daily temperatures can range from below freezing to mid 60s. Being prepared with insulated waders, gloves, hand warmers, layered clothes, good food and hot coffee can make sure anglers remain comfortable as well as safe. A mistake made by many anglers is fly fishing with the same waders used during the summer. These waders are simply ineffective when compared against the larger and more insulated waders designed specifically for warmth and with over-sized boots to better accommodate heavy socks and heater packs. Feet are typically the area most susceptible to the wet and cold and even in the extreme cold, feet usually sweat and sweat will make feet damp and chilled. Wearing more socks will not make feet warmer but will instead impede circulation. Instead, a simple two-sock system should be used comprised of a thin nylon/spandex “liner” sock (no cotton), used to wick moisture away from the skin, and a second thick wool/nylon sock, for warmth. Care should be taken to ensure toes can still wiggle within the wader, as a restrictive fit inhibits blood circulation, making feet cold. On very cold days, chemical heat packs placed between the two socks provide additional warmth for very little bulk. Though I have yet to try them, several hunting friends raved about the effectiveness of the new Thermacell boot heaters in keeping their feet warm during late season deer hunting. Fingers are the second body part that will suffer in the cold. I carry at least two pairs of gloves so that I can replace them if I get a hand wet unhooking a fish. Synthetic, hydrophilic gloves constructed of neoprene or fingerless wool gloves are the most popular options. In extreme cold, I will put chemical heater packs in both my pockets to warm fingers quickly if they take a dunking. The obvious trick to successfully fishing in gloves is practice, learning how to effective fly fish while wearing them. A couple quick practice sessions at home on the lawn go a long way in learning what works and what doesn't before venturing a field. Opening day 2015 was slow. There were less than a dozen people fishing at a time in the morning counting Erin, myself and our guide. There weren't many salmon caught. It wasn't anything like when I was there on opening day 2014. I wondered if the storm on March 31 last year affected the fish.